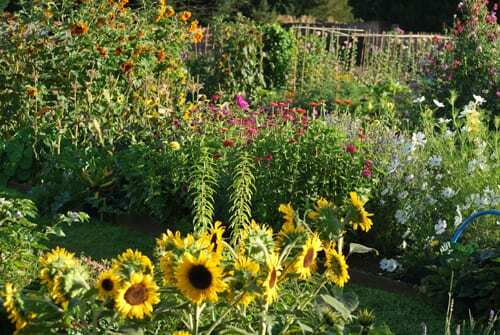 When I first heard about the new TV programme, The Big Allotment Challenge, I was so thrilled to learn that it featured a floristry element. 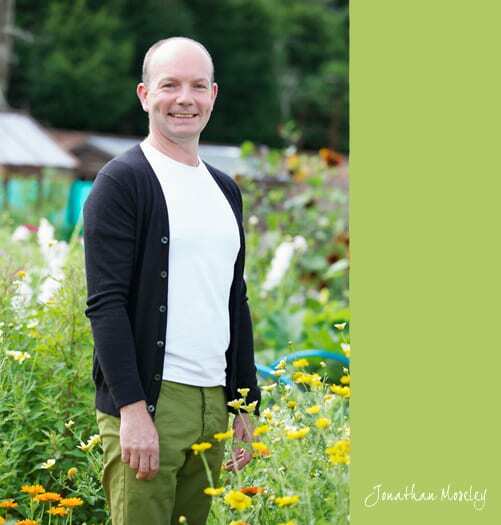 Today, I’m delighted to share with you an interview with florist Jonathan Moseley, who will be judging the competitors’ floral designs. The Big Allotment Challenge starts on BBC2 this evening. Could you tell us about the programme? 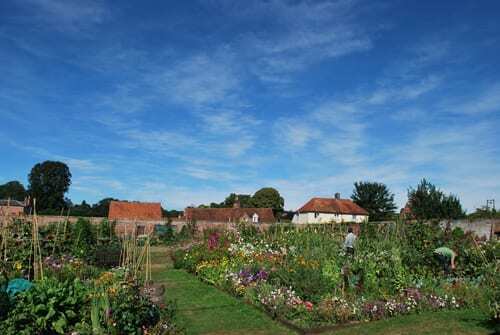 We filmed the show in the most idyllic location on a pretty but derelict walled garden on the Mapledurham Estate in Oxfordshire. Here, nine pairs of amateur gardeners were given identical bare plots of land, each with a greenhouse. Then, lots of hard work combined with Mother Nature’s magic transformed these empty plots into a flower-filled oasis of colour, scent and countless stems, all screaming out to be picked! The show runs for six consecutive weeks on BBC2 starting at 8pm tonight. Were the contestants advised which flowers to grow in their allotment? The contestants were advised that they would have to grow certain flowers ready for the Make challenge. For example, Sweet Peas and Roses. As you will see on the show, some of the flowers proved difficult and elusive for some of the contestants to grow. 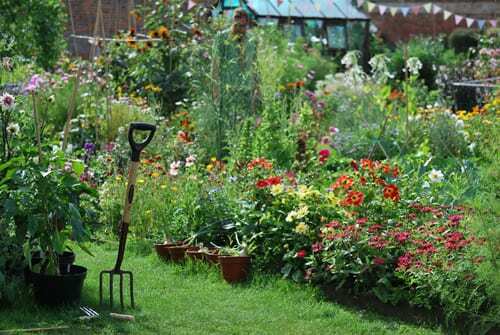 However, they were free to decide what other hardy annuals and summer flowering perennials they wished to grow. 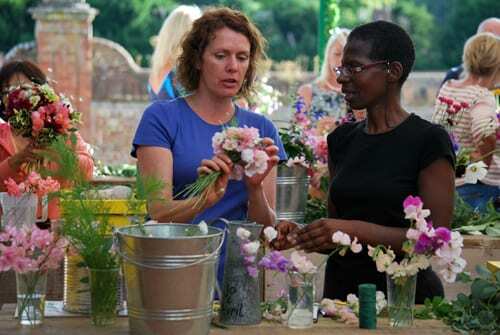 The teams knew that there would be a floristry challenge in each episode, so realised they had to include growing flowers for cutting within their plots. 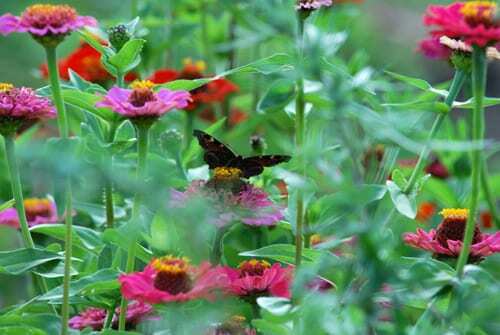 Naturally, many teams elected to grow tried and tested flowers like Zinnia, Larkspur, Cornflowers and Nigella. Some however were more discerning and grew some amazing materials like Atriplex, Molucella, Knautia, Anthriscus ‘Ravenswing’ and the stately umbels of Angelica to name a few. Did the contestants have any previous floristry experience? All nine teams were enthusiastic amateur gardeners with differing skill levels and abilities. People had been growing for different lengths of time dependent upon their age and lifestyles. With the exception of one team who were casually involved in doing the local church flowers, no one had done any arranging of home-grown flowers. For some contestants, the thought of formally arranging flowers was a really steep learning curve and they had to allow their inner creativity to manifest. And in some cases allow their masculinity to be temporarily sidelined in order to get in touch with their more feminine side. Could you tell us about the floristry challenges? How were their flower arrangements assessed? For each of the six episodes, I highlighted certain criteria which the designs required. These were also top tips to help the teams focus on what was important for each specific challenge. The teams were filmed selecting and gathering their flowers from the plots and I observed their workmanship during the timed challenge. Afterwards, each design was assessed for its own merits by myself, accompanied by my two co-judges. With over twenty years experience in commercial floristry, I have a keen eye and quickly spotted various mistakes, which were usually due to bad technique or ill thought through selection of flowers. Creating designs from garden flowers is very different to using commercial grown materials, so I was always eager to see innovative use of materials and extra often subtle embellishments which ensured the winning designs always stood out from the crowd. I’m always keen to encourage people and like to explain to them how and why something has not worked, with a few pointers on how it could be improved in the future. The enthusiastic and motivated teams embraced my advice and they were the ones who showed progression and became the ultimate winners. What do you feel were the biggest challenges that the contestants faced, flower/floristry wise? 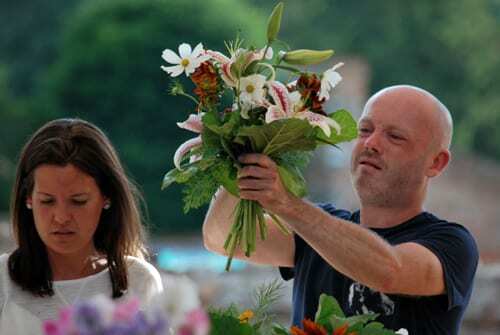 For many, the biggest challenge was arranging flowers for the first time. That alone was a demanding task in itself. Teaming this with strict time deadlines, availability of grown materials and the intense pressure of a televised competition, then the floristry tasks were a potential nightmare. However, each team always pushed the boundaries each week and I was often amazed by their ingenuity and creativity. For many, it was quite difficult gathering the flowers because they had toiled over them for weeks and weeks. We all can empathise with how hard it can be to pick something from the garden when it looks so pretty and perfect happily growing, with the knowledge that once it is picked it will die a lot quicker. Once people were arranging, then they became absorbed by the task and quickly fell under the spell that the magic of arranging flowers offers. Ironically, some contestants referred to it as the most relaxing part of the competition! Thank you very much to Jonathan for all his help in compiling today’s blog post. I’m so looking forward to watching the programme! (I’m out tonight, but will be catching up on iPlayer asap.) 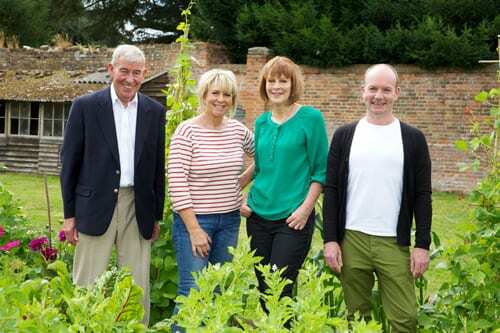 Here is Jonathan with Fern Britton who presents the show and the other judges…gardening expert Jim Buttress and preserves expert Thane Prince. If you would like to make the floral designs featured on the show, you’ll find them in the book which accompanies the series, The Big Allotment Challenge: The Patch – Grow Make Eat by Tessa Evelegh. And if you’d like to follow Jonathan on social media, he’s on Facebook and Twitter. Plus he also has a new website. P.S. The Big Allotment Challenge is also on Facebook, Twitter and Instagram.